Over the past few years, a few of the African American athletes who are in the NHL have received racist taunts from different fan bases—the most recent being in 2011, when fans threw bananas at Wayne Simmons of the Philadelphia Flyers, and in 2012, when the Capitals Joel Ward received death threats and racists messages after scoring a playoff game-winner. 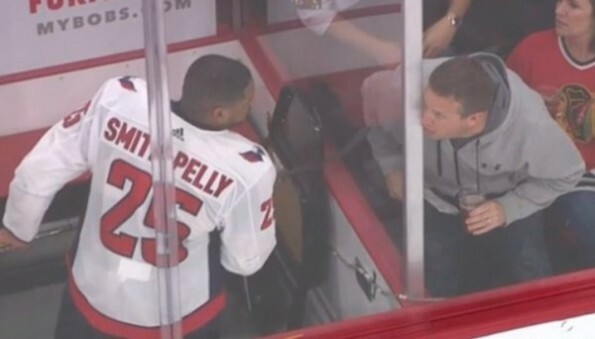 That racism reared their ugly head once again when two fans of the Chicago Blackhawks were ejected from last night’s game for taunting Washington Capitals’ Devante Smith-Pelly. “Four fans were ejected from the United Center on Saturday night for directing racist comments at the Capitals’ Devante Smith-Pelly while he was in the penalty box during the third period of his team’s game against the Blackhawks. The Washington Post reported that a Capitals official said the fans yelled “basketball, basketball, basketball” at Smith-Pelly, who is black. United Center security was notified of the incident and kicked out the four people. According to the Associated Press, all four fans were male.